A Blind Girl: Thank you for your kindness, sir. Charlie Chaplin's "City Lights" contains a blend of humor and humanity that make it memorable for everyone who watches it. Although made very much in the old-fashioned silent film tradition, much of it is timeless, too. After a few minutes of slapstick at the beginning, Charlie's "little tramp" character makes two acquaintances. He meets a blind girl selling flowers, who mistakes him for a rich man, and the two become very fond of each other. Then he meets a real millionaire, who is drunk, depressed, and about to commit suicide. In a comic scene, the tramp persuades the millionaire not to go through with it, making himself a devoted friend. The tramp soon learns that there is an operation that could give the girl her sight, and tries to think of some way he could help. 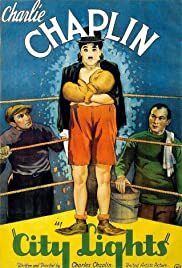 His scenes with the girl and her grandmother are moving, while his determination to help lead him into some comic escapades - his attempt to win money in a boxing match being particularly funny, and one of Chaplin's best comic pieces. Meanwhile, when his millionaire friend is drunk, he dotes on the tramp, but when sober he forgets who the tramp is, leading to more amusing scenes and occasional trouble for Charlie. All of the comedy leads up to a finale that is one of the best-remembered scenes in any film. "City Lights" shows the power of the camera in the hands of a master, who without words can move his audience or make them laugh. Anyone who appreciates good cinema should see it at least once.